Congratulations to Mike, our employee of the month for May! After serving four years in the Navy, Mike became an optician in 1984. 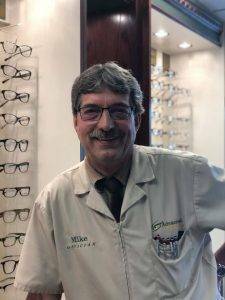 He started his career by grinding prescription lenses, and a few years later, began helping people pick out the best frames and lenses for their prescription as well as doing frame repair and edging lenses. Mike has worked at Advanced Eye Care with Dr. Anderson since the business began in 1999. Since then, he has become known among our staff and patients as a master of glasses adjustment, frame repairs, and selecting great frames! He is praised by our staff as one who is always willing to go out of his way to help others. Outside of the office, Mike enjoys fishing, going to hunting camp, working at bingo, and volunteering with his local fire company. As employee of the month, Mike has selected an organization that will receive a donation from Dr. Anderson. He has chosen the Pregnancy Resource Clinic in State College and thanks them for their work in the community!